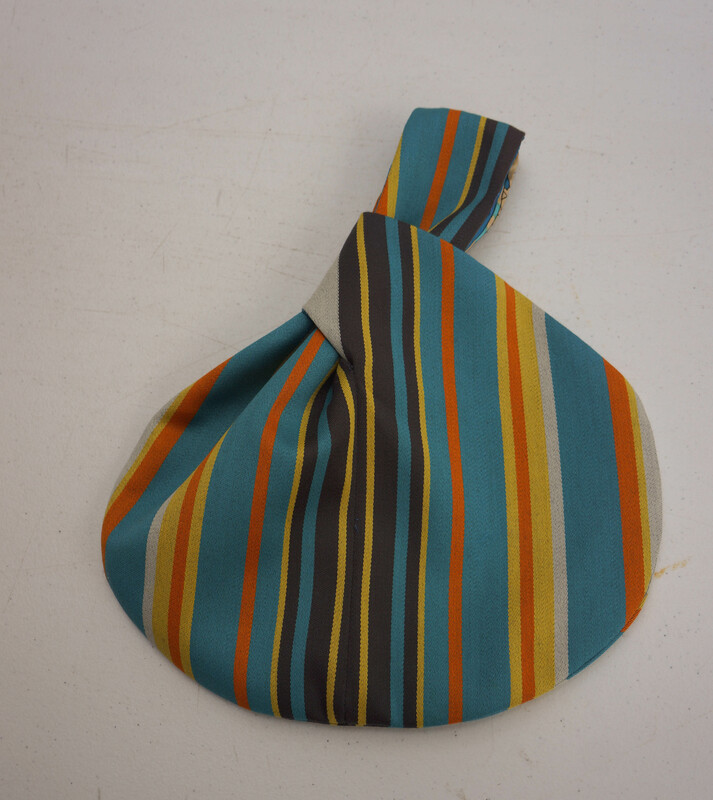 Japanese knot bag: Ready to sew? Welcome back sewalong adventurers: by now you should have printed out the pattern and taped it together. You will also have burrowed deep into your stashes to find fabric for your bag. 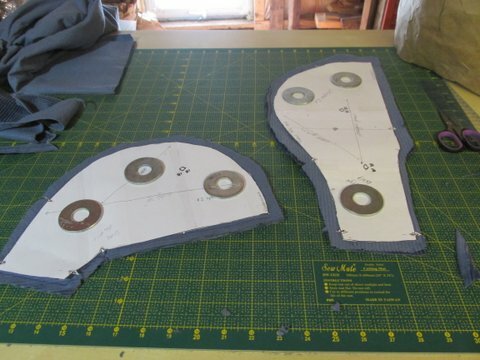 Lay out the pattern on your fabric and decide whether it’s the right size. Now is the time to make it bigger or smaller. Eyeball the length of the handle in the pattern. It’s quite short because I have small hands. If you want it longer, just add length to the top of the long side. Remember to move the top notches up. Cut out taking particular note of the notches. 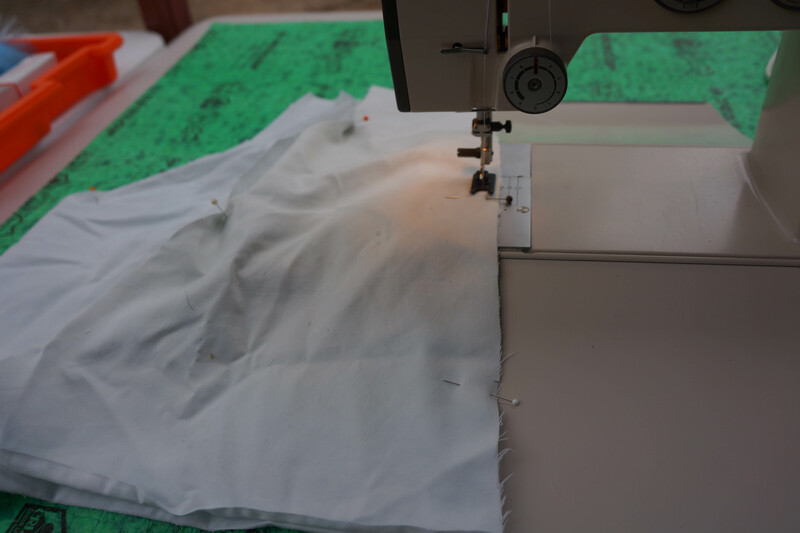 You need two pairs of sides of each fabric – the outer fabric and the lining. One side is designated the “long” side, and the other side is the “short” side. I think it’s clear which is which :). I have allowed 1cm seam allowance. Make this bigger if you wish when you are tracing your pattern. Or you can cut it out and have a slightly smaller bag if you use a bigger seam allowance. Here is Hélène’s bag, note that she has added extra seam allowance all the way round. If you are going to add a pocket, now is the time. You will have the outer layer and the lining. 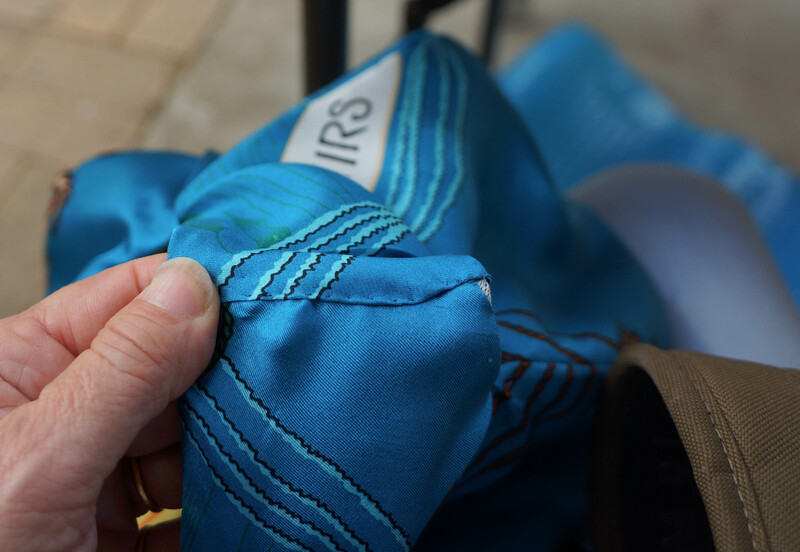 Sew the outer bag together and the inner bag together, remembering to stop at the notches. Press. You will essentially have two complete bags. Now is the time to check the opening. Is it big enough for your hand? If not, unpick a bit of the side seam. Repeat for the lining. The outside needs to be turned inside out and the lining put inside so that you have right sides together. Join outside and inside at the handles only. I tend to pin to make sure it all fits. Sew each pair of sides, leaving the tops of the handles open. You will need to pivot at the bottom of each section, which is the trickiest part of the whole bag. This was extremely difficult to photograph. Turn right side out through one of the handle openings. Give it a good press! A ham is really useful. It will look like this. 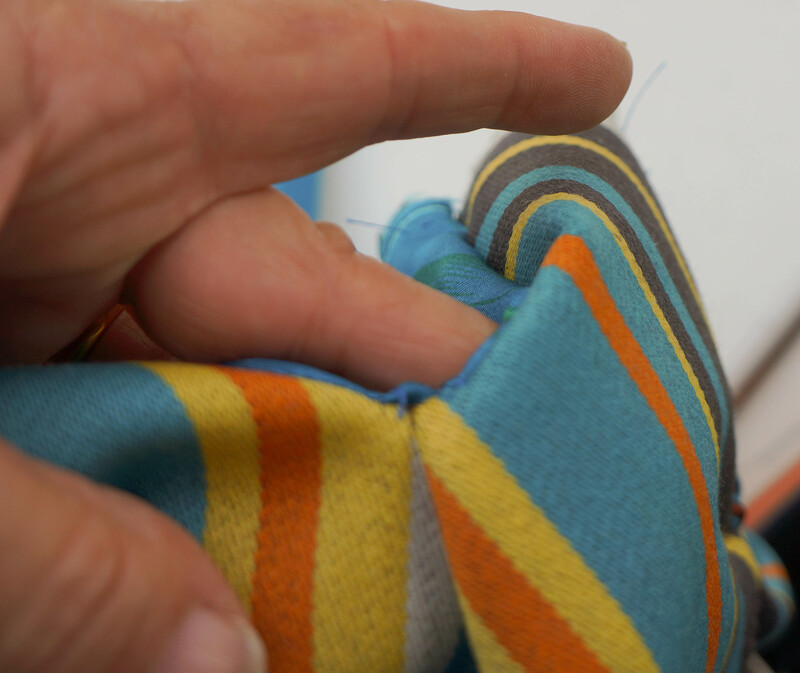 If you are really keen you can topstitch round the outside, keeping the stitching close to the edges. It will never sit nicely, so unpick a bit, and put in a couple of tiny hand stitches to hold this bit together. You can, of course, turn it all inside out again to restitch. Join the outside handles together, right sides together. 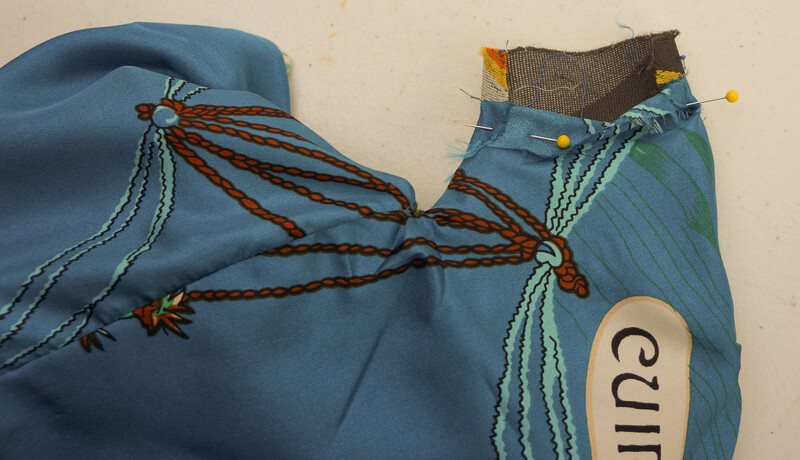 I pin the lining out of the way so that I don’t accidentally catch it when I’m stitching. 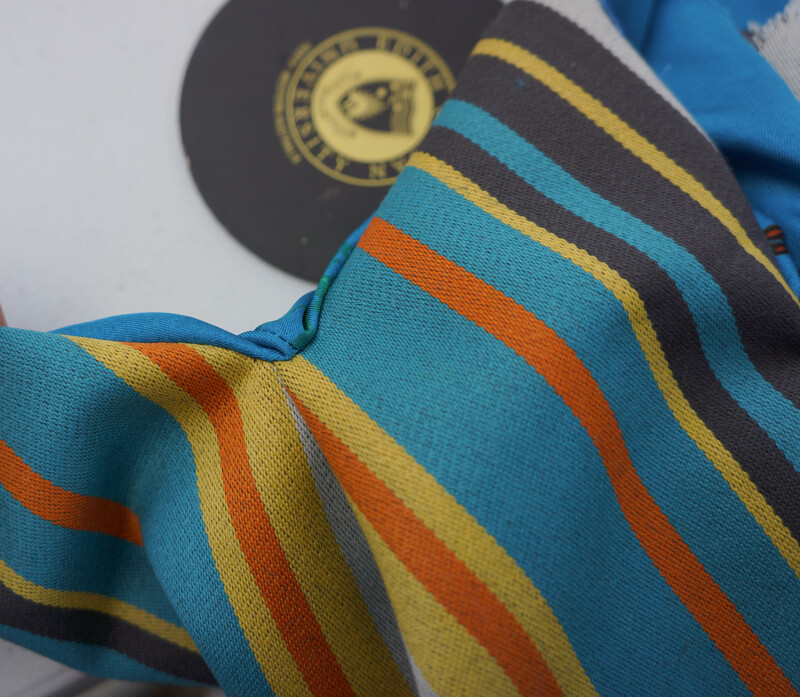 Then fold the lining over the seam and hand stitch it. Final press and you are done! There is no limit on the number of these you can make, and you will get quicker with them as you go along. 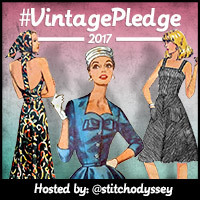 For those of you participating in the Facebook Sewalongs and Sewing Contests group, we have two more sponsors to add to the list for prizes for this month’s sewalong – Sewing Patterns by Mrs H and Deby Coles from So Sew Easy is donating two PDFs from her site. Please visit their websites to show your appreciation! Just a note: If you have landed on this page by some sort of misadventure and want to join in, then the first sewalong post is here. Thanks so much Sue! Can’t wait to get started with mine. Sue, how much smaller do you make yours for an evening bag? I reduce by about 2.5 – 3cms. I think I just responded to your post on FB? Would you like a comparison photo? I will have to remember to try this one. It’s on my “sewing to do” list. I have done a free pattern for a purse by Sewing patterns by Mrs H. I was very happy with it! Try and get it done this month and you might win more patterns! Can I alter the pattern to put…. say a pocket on the outside? Yes no problems. I think I cover that in the first post. Make it the size and shape you want and see it on before you sew the two pairs together. Is it ok if I alter the pattern to say.. include a pocket on the outside? Sue, when finishing on the handles, you say sew wrong sides together. Is that suppose to be rst? Just checking, can’t make mine work putting wst. I must be going mad. Sorry Judy. Definitely RST. Will change post. Thanks for the alert! Hi, I am trying hard to find the pattern for the knot bag. Where is the link for the pattern? Ann, it’s embedded in this post https://fadanista.com/2015/11/01/japanese-knot-bag-sewalong-decisions-decisions-2/. If you can’t find it, let me know and I’ll email it to you. Not strange at all which is why I make most of them reversible!